WENGEN, Switzerland (AP) — Only by Norway's stellar standards in men's Alpine skiing has this World Cup speed season been low key. Less than a year after long-time stars Aksel Lund Svindal and Kjetil Jansrud finished 1-2 in the Pyeongchang Olympic downhill watched by Norway's crown prince , results in the marquee event have been elusive. Ahead of the classic Lauberhorn race on Saturday, Svindal and Jansrud have combined for one podium finish in four downhill races this season. Norway's only downhill win came from Aleksander Aamodt Kilde, the heir apparent in a team that famously works hard and helps each other. "We haven't been as good as we were some years in the past," Svindal told The Associated Press on Thursday. "We have some work to do but it's still not bad, because we're right up there." 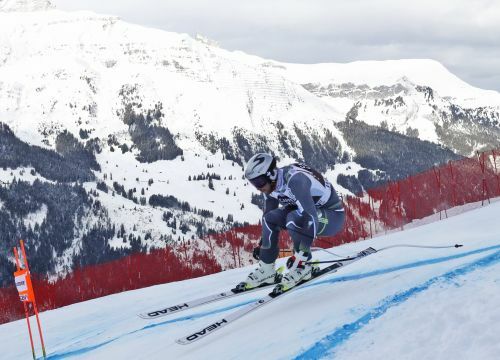 Svindal and Jansrud both have recent victories in the other speed discipline, super-G, in which they were the 2010 and 2014 Olympic champions, respectively. Still, it is unusual to see season-long downhill standings with two-time winner Svindal in seventh and 2015 champion Jansrud trailing 20th with no top-10 finishes. American veteran Steven Nyman, who is several months older than fellow 36-year-old Svindal, with similar wear and tear on surgically repaired knees, has noticed a little difference this season. "Jansrud is not himself and Aksel, sometimes you look, he's just not super-comfortable," Nyman told The AP after placing fourth in downhill practice on Thursday. "They're not the week-in, week-out dominant that they usually are. I don't know if that's age ... or if something's different." Full judgment should best be reserved until after the downhillers' peak season on the next four Saturdays — World Cup races on storied hills at Wengen, Kitzbuehel in Austria, and Garmisch-Partenkirchen in Germany, then the world championships in Are. Norway fans are expected in big numbers on Feb. 9 in neighboring Sweden, where Svindal took downhill gold at the 2007 worlds. At Wengen this weekend, 2013 winner Christof Innerhofer of Italy expects much from Svindal, who finally won in 2016 on his 10th start down the World Cup's quirkiest course. "When the conditions are too tough like in Bormio maybe he's not the best," said Innerhofer, the runner-up there last month as Svindal placed 12th. "But I think in other conditions, like here, he is for sure one big guy to beat." With sunshine forecast on Saturday, racers can expect a full, stamina-sapping ride down the 4.2-kilometer (2.6-mile) track in about 2 1/2 minutes — by far the longest in the World Cup. "As every downhiller wants, you want the full classic," said Bryce Bennett of the United States, who had career-best fourth-place finishes in the past two World Cup downhills, both in Italy. Bennett also was fourth in Wednesday's training run. Dominik Paris, who won on home snow at Bormio, won Thursday's practice on a shorter course, 0.33 seconds ahead of Johan Clarey. Frenchman Clarey set a World Cup speed record of 161 kph (100 mph) here in 2013, a mark unlikely to be beaten due to course modifications. Matthias Mayer, the 2014 Olympic champion, was fastest for the second straight day, clocking 144 kph (89 mph) on Thursday on the Haneggschuss straight about 30 seconds from the finish line. World champion Beat Feuz eased into 10th place, though made his statement on Wednesday by clearly winning practice down the full distance. Feuz is the logical favorite on Saturday to give his home Swiss crowd a sixth success since 2008, when Bode Miller was the last American to win. It would complete a Lauberhorn hat trick after Feuz won in 2012 and last year.